I promised I would get these done and then in the process I realized that next Monday is MLK day so I'm glad I switched up my week anyway. Today you get another Safari Park cell phone shot from Sunday since I didn't get to shoot Milky Chance after all. 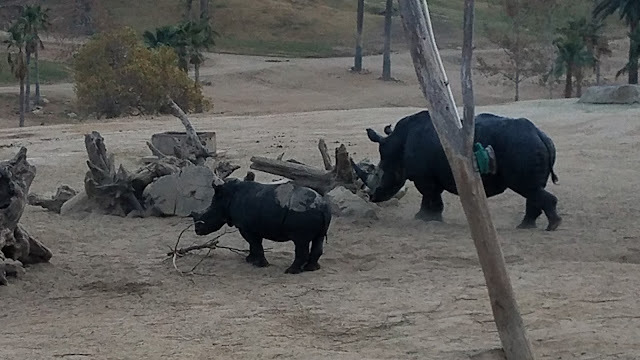 It was actually super cute, because mama and baby were down in the valley and came out of a little stream (why their coloration is so dark in this photo), then walked the perimeter of the fence and playfully jousting with another grouping of rhinos. Turns out the 3 year old's mom is preggers, so it's pretty special to catch them all hanging out by the lookout. It seems to be a pretty slow start to the year so far, but tonight I'll be slinging merch for Suzanne Santo, I'll try to hit Dirty Sweet on Friday, and on Sunday I'll be selling for Luna. Tuesday through Thursday archives are after the jump.